Near-term and long-term experiments accompany the overarching question of each science driver. These experiments represent simulation targets for v1 and v2 of the E3SM system during the first 4 – 6 years of the project (Phase I and II) and for v3 and v4 in the 10-year horizon. The v1 and v2 simulation campaigns are designed to “stretch” goals for the initial round of E3SM development and preparatory steps toward a grand challenge objective suitable for the extreme-scale computing resources anticipated for 2020 and beyond. The v3/v4 campaign is designed to revolutionize the E3SM projections connected with each driver and utilize the full power of the Exascale systems leveraged with transformative advances in model physics, numerical formulation, analytics, and computational implementation. Consistent with the three science drivers and associated overarching science questions, the science questions motivating the near-term, medium-term, and long-term model development and experiments are listed in the table. The v1 science questions investigate the role of nutrient competition in carbon-climate feedback. They motivated the development of key model features in E3SM v1, including representations of phosphorus cycle and nutrient competition in the land model. In v2, the project’s biogeochemistry questions will have a stronger regional focus on understanding the response of biogeochemistry in North America to global and regional forcings. The shift to a more regional focus in v2 is driven by a desire to more explicitly address DOE’s need in understanding changes in biogeochemistry affecting U.S. energy-sector decisions. These questions motivate coupling of human and Earth-system processes and use of the improved regional refinement capability in E3SM. The representations of some important processes are still be inadequate or missing in the v2 model. 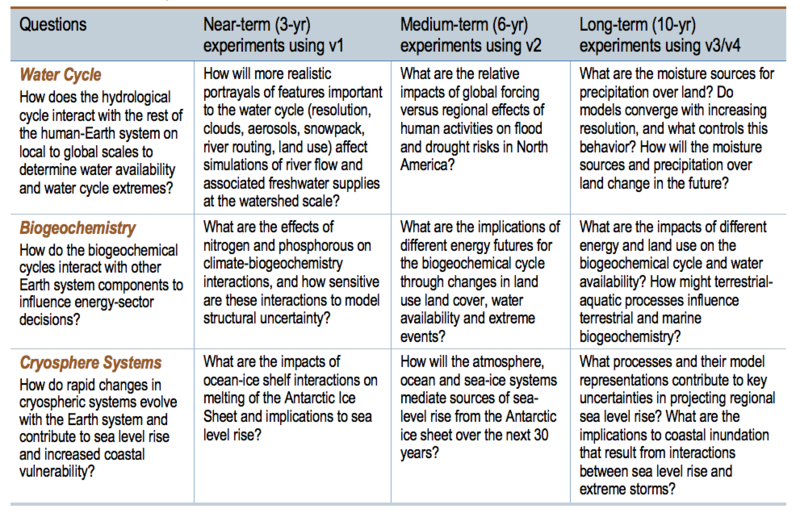 Hence in v3/v4, the science questions will build on and extend from the v1/v2 questions to address major uncertainties in predicting future changes in water cycle, biogeochemistry, and cryosphere systems. This motivates significant model development to address processes that are poorly represented or missing (e.g., two-way interactions between natural and human systems, terrestrial- aquatic interactions) in v1/v2. Progressing through four versions of E3SM, the project’s science questions, summarized in the table, will be addressed by optimizing the use of higher resolution, increasing complexity, and larger ensemble size with our exascale computational strategy to improve predictions of future changes in biogeochemistry systems that challenge energy production and use.